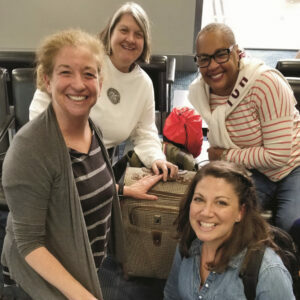 STM parishioners Dana Fugaro, Mary Giambruno, Denyce Cartier and Gigi O’Shea spent a week in Kingston. Jamaica, working with the Missionaries of the Poor. The Brothers care for hundreds of disabled, discarded men, women and children. Daily tasks the volunteers help with are feeding those who cannot hold a spoon, brushing teeth, sweeping up after meals and general housekeeping chores. Most important is showing the poorest of the poor that they are loved and not forgotten. Smiles, laughter and hugs go a long way!! This Good Friday, there is a special collection for the Missionaries of the Poor. Your contribution will be used for the things a smile cannot buy—food, medicines, diapers and hygiene products. Please help!